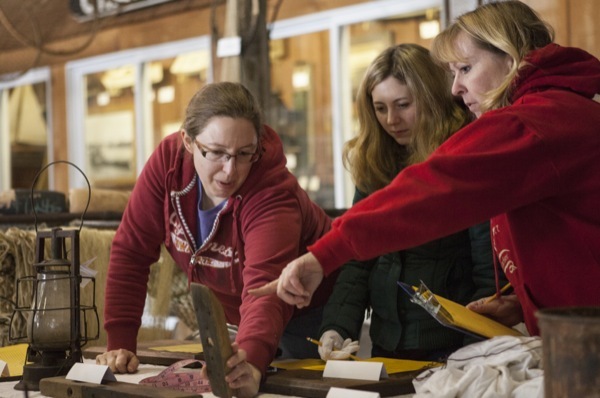 Tracy Jentzsch (right) works with graduate students Rachel Beyer (left) and Della Keyser at the Upper Bay Museum. 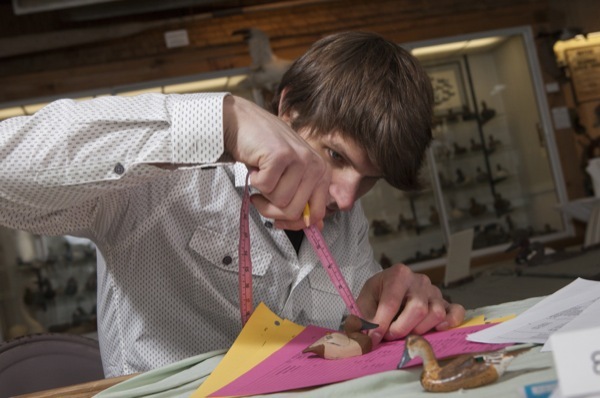 Sequoia Barnes works with miniature decoys at the Upper Bay Museum. 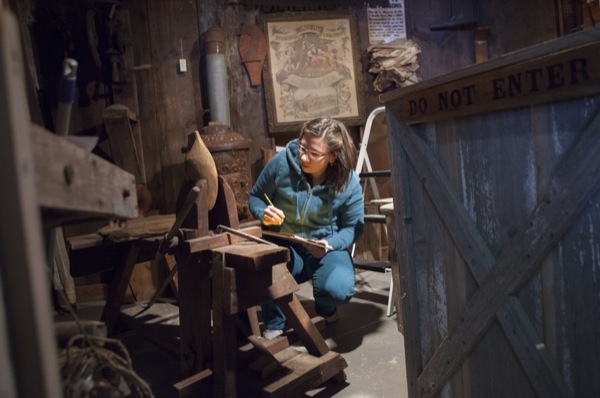 Nicole Belolan, a doctoral student, works in the Decoy Shop at the Upper Bay Museum. Josh Gates works with miniature decoys. Decoys are an important part of the Upper Bay Museum. The Museum Studies Program SWAT team at work at the Upper Bay Museum. 10:21 a.m., Jan. 31, 2014--Frigid temperatures and a lack of building heat were no match for a group of University of Delaware graduate students in the Museum Studies Program last week. 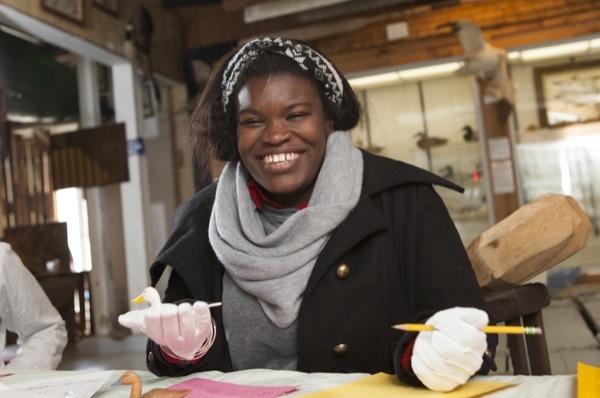 With dedication in their hearts and determination in their eyes, the students set out to clean, label and catalog hundreds of items related to hunting and fishing at the Upper Bay Museum in North East, Md. The students represented a variety of areas of study, including history, fashion and apparel studies and historic architecture and design. With the help of Katherine C. Grier, director of the Museum Studies Program and professor of history, and staff assistant Tracy H. Jentzsch, the students put their knowledge to work in identifying and understanding the many objects in the museum’s collection. By participating in UD’s fifth annual eight-day service project, dubbed SWAT and funded by an Institute for Museum and Library Services’ Sustaining Places grant, the students experienced on-site and hands-on opportunities not readily found elsewhere, Grier said. Covering a four-state region, the grant that funded the project was created after a national study found that 80 percent of small museums lack systematic records of their collections, which are in danger of falling into disrepair. This year, the SWAT team worked at the museum Jan. 20-23 and Jan. 27-30. “The benefits of participating in the SWAT program are the students’ ability to take their content knowledge and skills acquired through traditional classroom experiences and apply them to real world experiences,” Jentzsch said. Students receive credit for the work toward a Museum Studies certificate and also get the opportunity to network with museum professionals to build strong relationships for future job placements. Originating in the late 1800s as H.L. Harvey, a local fish house that officially closed in the 1960s, the building was purchased in the 1970s by North East, Md., to preserve the very culture that had allowed the town to prosper. 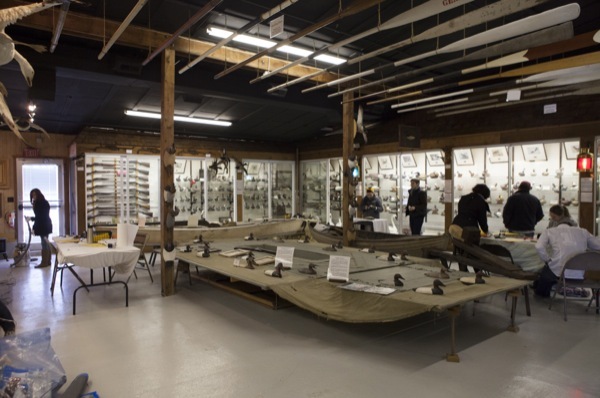 Today, the Upper Bay Museum houses an extensive collection of hunting, boating and fishing artifacts that date back to the 1800s. With hundreds of items and little existing historical identification for many pieces, the museum called on the SWAT team’s extra hands and expertise to make cataloging and labeling the collection more efficient. Through non-invasive cleaning techniques with lightweight hand brushes and variable speed vacuums, each item delicately shed the years of accumulated dust. After pieces were labeled, numbered, photographed and cataloged, the information was transferred and stored in PastPerfect, a computer database. Although tedious, the process was necessary to efficiently provide the museum with proper documentation. Students noted the museum’s vast array of interesting and unique pieces, but there was no missing the extensive collection of duck decoys, complete with a period room Duck Decoy Shop. 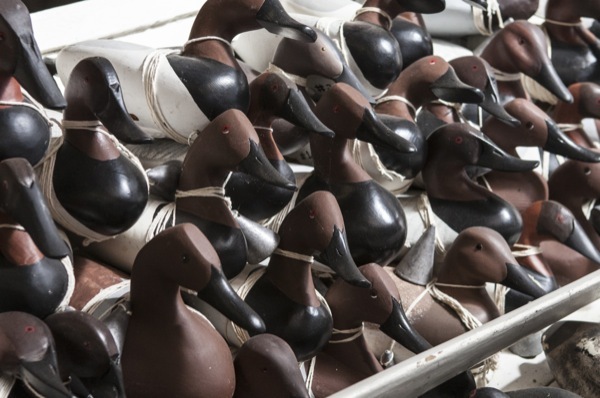 Though the installation is a replica, the makeshift sander belts, benches and carving tools provide a snapshot into duck decoy culture, a vital aspect of the hunting industry that thrived along the Chesapeake Bay and its tributaries. Also on display in the museum is a boat known as a double sink box, the only one known to be still in existence, which aided duck hunters. The sink box rig would submerge, surrounded by hundreds of duck decoys. The two hunters who could fit in the boat were able to kill 400-500 ducks a day, shipping them to the restaurants and hotels. The sink box was eventually outlawed in 1935 to protect declining duck populations. The museum has its annual season opening on Memorial Day weekend, when it also hosts gunning demonstrations. These re-enactments will be held this year on May 24 beginning at noon. The gift shop showcases local artists and authors, and an adjacent building hosts the Chesapeake Wooden Boat Builders School. The Upper Shore Decoy Show at the museum on Oct. 18 will feature demonstrations such as decoy making, waterfowl taxidermy, chair caning (by the Boat School) and oyster shucking.